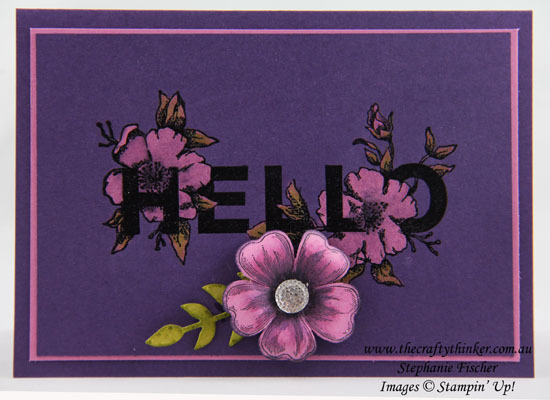 Another image from the Floral Statements stamp set and another treatment. This one is painted with bleach. I tapped my stamp into Versamark and then into Basic Black Archival ink, stamped onto Elegant Eggplant cardstock and clear heat embossed. To be honest, the Versamark probably wasn't necessary because the Archival ink stays wet (or "open") long enough to add the embossing powder. However, I was cold and had the air-conditioning going so played it safe! I painted the flowers and leaves with bleach and then added some Pear Pizzazz to the foliage. I layered my floral image onto a piece of Sweet Sugarplum cardstock before adding to my Elegant Eggplant card base. 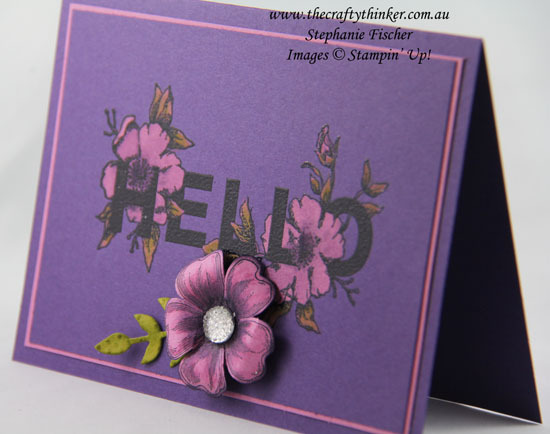 My next step was to stamp a flower from the Flower Shop stamp set in Basic Black Archival ink onto Sweet Sugarplum cardstock and watercolour a little with some Sweet Sugarplum and Elegant Eggplant inks before cutting it out with the matching Pansy Punch. I snipped down between the petals a little, curled the petals down with a bone folder and depressed the centre of the flower with a ball tool on a firm sponge before adding a Faceted Gem. The little piece of foliage is cut from Lemon Lime Twist cardstock with one of the Bouquet Bunch dies and sponged with some Pear Pizzazz ink. 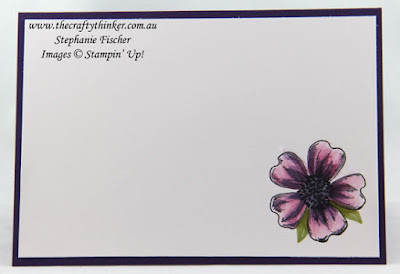 I also stamped and watercoloured a flower inside the card.